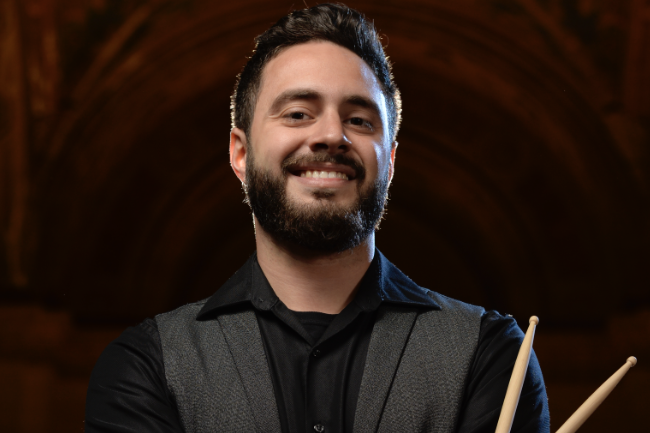 Band leader/drummer/vocalist Dane Wright began playing music at age 6 along with his childhood and best friend Casey, who plays guitar alongside Dane in his band to this very day. That is just part of the chemistry that makes the Dane Wright Band one of the hottest in the private party business. Dane and Casey were influenced by the music that his parents listened to including: The Beatles, Moody Blues, Rolling Stones, and Led Zeppelin. As a result, Dane always had a passion for classic rock. Throughout high school, Dane formed several bands and got into the Œbar scene¹ at a very early age and his group became the regular house band at multiple clubs. At that point, Dane knew he wanted to pursue a career in music. He graduated from Five Towns College majoring in business, and also focusing on Audio Recording Technology. Today, the Dane Wright Band has made a great name for itself with its high Energy performances, audience engaging personalities, and wide ranging vocal styles including Top 40, Hip Hop and R&B, Classic Rock and a tremendous repertoire of party favorites from the 60s to the 90s and early 2000s. I apologize for not reaching out sooner, as we have just returned from our honeymoon and have been soaking up the "post-wedding reflection" period. I will start by tipping my cap to the entire Dane Wright band- to say you guys killed it would be an understatement. Your performance easily exceeded any expectation I had entering the wedding (and word of mouth was extremely positive for you guys coming in so expectations were quite lofty to begin with lol). I cannot thank you and your band enough. As you know, a wedding day is BUSY, so busy that memories could easily be lost in one big blur. While our day was indeed fast-paced and at times blurry, your band's presence and personality left us with memories that will last forever, something that is truly priceless. From the beautiful opening ceremony music to closing the night out with "shout", you guys stood out as a true highlight of our special day. We easily received more compliments over the Dane Wright band than all of our other vendors COMBINED (including the milkshakes which were a hit lol). Bringing joy to people's lives is at times challenging, but important in today's world. Please feel great about yourselves and the job you do as you bring more joy to people than you even realize. Thank you again for everything, and best of luck to the band, although it is definitely not needed!!! Keith and Samantha Denis AKA the "Fungos"! I just wanted to say thank you for the most amazing performance at our wedding!! Josh and I, as well as our guest had a BLAST!!! You guys rocked and kept everyone up on the dance floor all night! You guys are awesome and I hope to see you guys perform soon!!! Have a wonderful weekend!!!! I cannot begin to explain how truly amazing your band was at our wedding. To say you exceeded our expectations would be an understatement so, I'll just say you rocked it. The party did not stop and when it did, it wasn't over! Thank you for an incredible night and for taking our family in to play! Truly incredible! We will recommend you to everyone, although your performance definitely sold the band! We hope to work together again someday! Thank you so much! We just wanted to thank you for helping to make our wedding such an incredible night. You and your band were absolutely amazing. The music choices were perfect and our guests could not stop raving about how much they enjoyed the music and how fantastic the band was. Looking forward to seeing all of you again in November at our friend's wedding! Thanks again!! We wanted to write a quick note to thank you (x1000000) for recommending Dane's band and for giving us such a great deal. They were OUTSTANDING! I cannot gush enough. I had the most perfect time at the wedding and it was the much fun night of my life, which I attribute largely to the amazing music and incredible energy of the band. We definitely have a good group of party people as our friends and I think everyone brought it to an entirely new level at the wedding thanks to Dane and the band. We will be recommending Dane to any and all engaged couples we come across in the future. Please let us know if you ever need anyone to sing their praises - we would be happy to do so. Still dreaming over the best evening of our lives. Jason and I wanted to send you the deepest thank you. It was honestly the most magical evening; we had the best time. Everything was absolutely perfect and we can't thank you enough. The Dane Wright Band was absolutely amazing; really truly the best band we ever have listened to, and EVERYONE made sure to comment on how amazing they were. We can't wait to share photos and videos with you when they come back. Please give Dane a big hug and kiss from us; he and his band were OUTSTANDING! Thank you again for everything! We will never forget this weekend!! We just celebrated our two-year wedding anniversary, and although this is quite delayed - to this day the first thing guests at our wedding say is "Your band was AMAZING!". We had the Dane Wright Band and it was far and away our best decision. Another frequent comment - "it was like being at a concert!". We would be delighted to write a review of this band if ever needed. While we had an amazing venue (The Royalton Mansion in Roslyn) we know the event would not have been the same without the band. We just wanted to thank you again for a wonderful evening! Everyone was up and dancing the entire time, and absolutely adored the Dane Wright Band! You made the weekend very special. We're off to our honeymoon boarding now but couldn't leave the country without saying a huge thank you to you and the Dane Wright Band. You are all rock stars and so talented. "best band I've ever heard" and " felt like I was at a live concert" to name a few of you the compliments you received. Thank you for making our wedding the amazing energetic party that it was... And for NAILING the special first dance songs!! My wedding was yesterday. Dane and his band absolutely killed it!! My friends and family danced the entire night away to our favorite hits. I couldn't imagine any reason to go with any other wedding or special event band. They are all professional, and charismatic. The energy they have is unmatched. Do yourself a favor. Stop looking for other wedding band options. This band will surpass your expectations, and then some. THANK YOU GUYS A MILLION TIMES OVER!! !